I've wanted a hybrid car for a long time. Growing up in England I was able to get away without owning a car for quite a while and actually owned my own home first. But, without its own oil reserves, England's petrol prices and availability were subject to fluctuation as troubles flared up and died down in the Middle East. Unlike in the U.S.A., buying fuel was a noteworthy event. If you rode in someone's car you shared the cost of petrol. As an engineer working with other engineers, I was often exposed to discussions of ways to use less fuel. We knew how inefficient the Otto-cycle internal combustion engines in our cars were. We thought a good solution would be a series hybrid with a constant speed turbine engine running a generator to charge a battery and electric motors drawing current from the battery to move the car. Well, decades later it turns out that the series hybrid is not the optimum mass-market solution. The efficiency of a piston engine can be improved using the Atkinson / Miller cycle or lean-burn and various other techniques. Energy loss associated with conversion of mechanical energy to electrical energy, storage in a battery and conversion back to mechanical energy again is best avoided by transfering at least some of the engine's power directly to the wheels using gears. Cars using these principles began to be available in the U.S.A. as the millenium turned over. I am rather to big to fit in the tiny Honda Insight, so the Prius became my choice when I decided to replace my ageing Mazda 626. 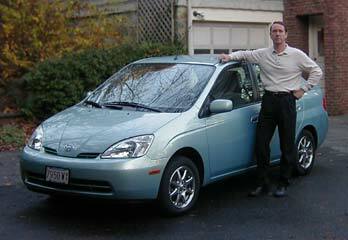 So, there I am, above/right, posed self-conciously by my Toyota Prius gasoline/electric hybrid car. This car is such a departure from conventional automobile engineering that I've felt compelled to try to understand how it works. This topic area of my Web site allows me to share my findings. Even if you're not inclined to delve into engineering detail, there may be information here that is useful to you. For example, most Toyota sales people know very little about the car and many have been known to make riduculous statements out of ignorance or a desire to sell a different model of car. Some service departments and a few supposedly trained and qualified technicians also appear not to understand how the car works or how to own and use it. I have tried to organize sub-topics in a way that allows you to find information at the right level. So, enough intruduction, on to the sub-topic links. Original ToyotaPrius site - this is my original area in which I first put together my Prius information. I am revising and reorganizing the Prius topic area, but have kept this in place for existing users. Questions and Answers - questions about the Prius and my best attempt at answering them. Battery Current Meter - how to add a display of battery current to your 2001 to 2003 model year Prius for about $25. You can use this meter to see for yourself how the Prius uses the battery and to optimize your driving for even better fuel economy. Prius Mini-Scanner - a small, self-contained scanner to connect to the Prius OBDII port. With this, you can monitor interesting things such as engine spin rate, battery state of charge and read out any trouble codes. Measurements made on my Prius - actual measurements of current, voltage, engine spin rate, intake manifold air flow, etc. that have helped me understand the details of how the Prius works. Graham's Personal Home Page (under re-construction). Last edited April 30, 2003. All material Copyright © 2002, 2003 Graham Davies. No liability accepted.